Proprietary Name: Wegmans Ultra Dishwashing Liquid Orange What is the Proprietary Name? Non-Proprietary Name: Dishwashing Liquid Orange Scent What is the Non-Proprietary Name? 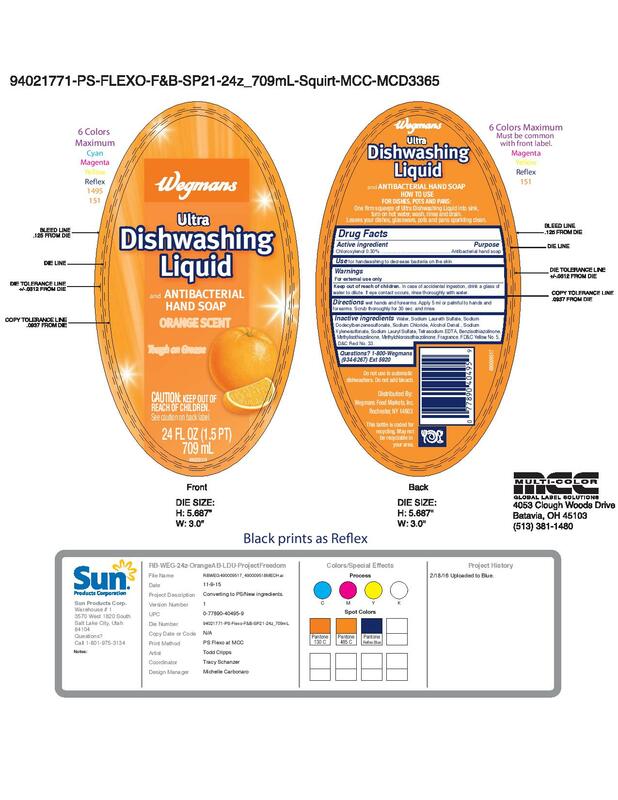 Wegmans Ultra Dishwashing Liquid Orange with NDC 54340-501 is a a human over the counter drug product labeled by Henkel Corporation. The generic name of Wegmans Ultra Dishwashing Liquid Orange is dishwashing liquid orange scent. The product's dosage form is soap and is administered via topical form. Keep out of reach of children. In case of accidental ingestion, drink a glass of water to dilute. If eye contact occurs, rinse thoroughly with water. Directions wet hands and forearms. Apply 5 mL or palmful to hands and forearms. Scrub thoroughly for 30 sec. and rinse. Inactive ingredients Water, Sodium Laureth Sulfate, Sodium Dodecylbenzenesulfonate, Sodium Chloride, Alcohol Denat., Sodium Xylenesulfonate, Sodium Tetrasodium EDTA, Benzisothiazolinone, Methylisothiazolinone, Methylchloroisothiazolinone, Fragrance, FD&C Yellow No. 5, D&C Red No. 33.